Oh hey Saint West! Proud parents Kanye West and Kim Kardashian have shared their first official photo of their gorgeous baby boy Saint West who was born December 5th. 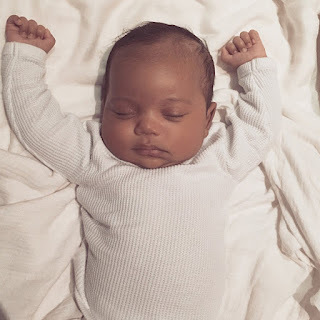 Kim shared the precious photo of Saint as a tribute to Kim's father Robert Kardashian. Kim said, 'Today is my Dad’s birthday, (February 22) I know there’s nothing more in the world he would have wanted than to meet his grandchildren. So I wanted to share this pic of Saint with you all..' He is just heaven sent..